A costume designer's process parallels the set designer's process, but with many important differences. 1. Text analysis: the costume designer looks specifically at the characters, the characters' actions, how the characters change through the play, the times and locations of the play, and the style of the play. 2. Production meetings: the costume designer must also work within a director's concept for the play, which may shift the time, place, or style from that indicated by the playwright, and coordinate with other designers' ideas. 3. The costume designer may present initial ideas in the form of thumbnail sketches, color palettes, fabric swatches, or pictures drawn from outside sources. 4. 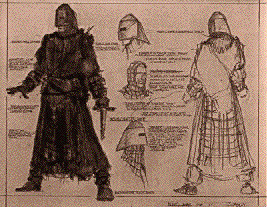 Once final designs have been approved, the costume designer creates renderings. 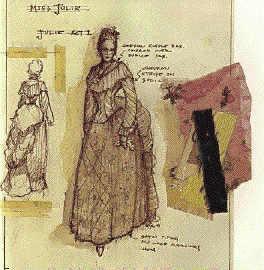 Unlike the set designer, who may create only one rendering if the play takes place on a unit set, the costume designer normally creates a different rendering for each costume. Sometimes one character will be drawn in various costumes in one rendering, or several chorus members might be combined in one rendering. Costume designers' renderings include swatches , or small samples, of each fabric to be used in the costume. 5. The costume designer gives the renderings to the costume shop for use in constructing the costumes. Thus, renderings may also contain verbal instructions. The designer may also sketch other views of the costume to aid the shop in building the garments, for example, an elaborate bustle on the back of a skirt would need a separate drawing if the rendering showed the skirt from the front. Outer garments or accessories might also be sketched separately. The costume designer does not provide the equivalent of the set designer's elevations or working drawings because costumes must be cut and fitted to the actor's body, not simply the designer's specifications. 6. The costume designer does not usually build or buy the costumes; this is the job of the costume shop. 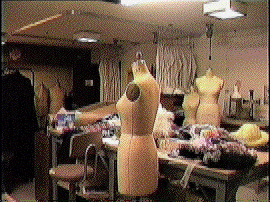 A designer will attend fittings when actors try on the work of the costume shop. The designer may make adjustments at that time, depending on how the garments suit the actor and character and the actions that character engages in onstage. For example, dancing or swordplay require very flexible costumes, which might be achieved either by enlarging a costume or using fabrics which move easily, like stretch knits. A single costume for a single character usually requires multiple fittings. 7. Designers join the entire group of artists, in the theatre where the play will open, during technical and dress rehearsals. Normally, sets, lights, and sound are handled in tech rehearsals, and the costume designer comes in for the first dress rehearsal, which is when costumes and makeup are added. Sometimes, when the costumes are elaborate, the designer, costume shop foreman, and director watch a costume parade. A costume parade is when actors come out singly or in groups in their costumes outside the context of the play, simply to examine the look of each costume, its appropriateness to a scene, and how groups of actors will look together. Of course actors have always worn costumes, but the job of costume designer evolved only in the 19th century with the general theatrical trend toward historical accuracy. While in rare cases a set designer might create costumes, like Inigo Jones' fanciful costumes for the Stuart Court Masques in the early 1600's or Jean Berain's costumes for the spectacles of Louis XIV's court, in most cases costumes were left up to the actors. In Shakespeare's company, the Lord Chamberlain's Men, each actor in the company provided his own costumes. Except for certain conventional costumes for characters like Ancient Romans, Shakespeare's company wore contemporary clothing of as fine a quality as they could afford. The company was given the cast-off clothing of the aristocracy and thus had a small stock of costumes belonging to the company. Hirelings and apprentices, who were not sharing members of the company, were probably costumed from this stock wardrobe. Audiences did not expect historical accuracy in costuming, but they did want visual splendor. The practices described for Shakespeare's company lasted for hundreds of years. 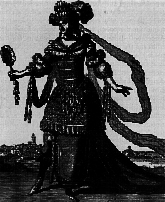 It often led to strange character inconsistencies; for example, a famous actress who commanded a high salary could appear in the best gown in the whole play, even if she were playing the maid within the story of the play. A few companies in the 18th century experimented with historically accurate costuming of period plays. This was mostly done to draw an audience, as an extra piece of publicity about the play. In these cases, it was usually the set designer or an actor-manager who selected the costumes. Often, only the lead characters were costumed in period clothing. In the 19th century, accuracy to the time and place of the play slowly became the normal means of production of period plays. Books of plates depicting costumes of various lands through history were published by the middle of the century, making it easier for theatre companies to copy old or foreign styles of dress. With the rise of the director toward the end of the 19th century, the role of the costume designer was firmly established, even for contemporary plays. Directors by the end of the century wanted the costumes to be appropriate to character as well as to time and place, and this required the artistry of the costume designer. In the 20th century, costume design for the stage and cinema has often been stoutly realistic, even when the style of scenery and lighting is stylized. Some kinds of productions, like musical comedies, musical reviews, science fiction, and children's theatre allow the costume designer more imaginative freedom. This century has enlarged the range of resources for the imaginative designer: a variety of synthetic fabrics, furs, and plastics can be used to make costumes for Cats or Star Trek aliens, for example.